On the 28th of April, Eden Cinemas prepare to bring you the movie circled around the legendary music event that represented a milestone in the rock history. On July 1st 2017 the most famous Italian Rockstar Vasco Rossi celebrated his 40 year career with an event that involved a “little” crew of 220 thousand fans. With 26 albums, more than 250 songs and 35 millions of copies sold, Vasco Rossi is one of the best-selling and most appreciated Italian singer. It is already known as the Concert that has broken any records: an audience of 220,000 people, 27 cameras in 4-5-6-K, 40 video-scenic designs, 500 video-messages during Vivere song performance, 35 editing lines. A concert that all Italians will remember. 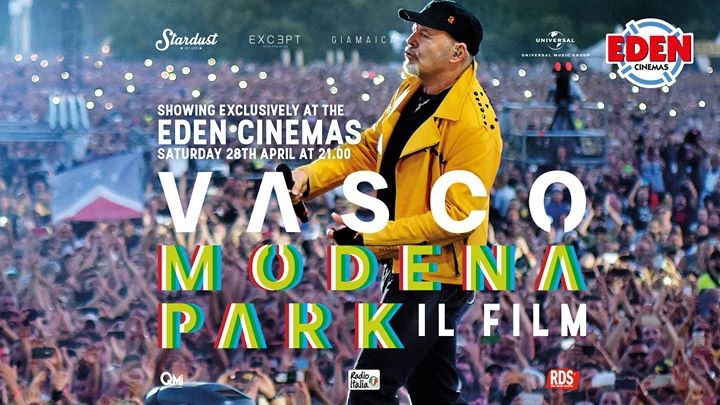 The Movie is more than two hours of rock and pure energy, in which Vasco Rossi will lead his Italian fans spread all around the world to discover the soundtrack of his fearless life.